I took a trip out to what is now called an agriturismo. This one is a restaurant converted from a winery. The family name is Mustilli, well-known producers of wine, located in the town of Sant'Agata dei Goti near Caserta, about 50 km/30 miles up from Naples off the main highway, the A1, to Rome. The interior is beautifully arrayed with dark wooden tables, historic photographs and antique farming tools and kitchen implements decorating the walls —and also some traditional musical instruments, including the one shown here (right) among the flutes. It is not a pepper mill! It's a ratchet (also known as a noisemaker or cog rattle), so named from the mechanical device that works on the same principle; that is, a gear wheel that allows motion in only one direction. 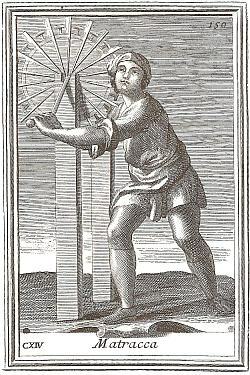 In the simple folk noisemaker (image, left), a gearwheel and a stiff board are mounted on a handle that rotates freely; the player holds the handle and swings the whole mechanism around. The momentum makes the board strike the gearwheel repeatedly in quick succession, producing a clicking noise. These simple devices have been used for many centuries, and some have a place in religious ceremonies (more, below). More elaborate versions have a stationary case (such as the one on the right): the gear mechanism is in a wooden case and is turned against flexible wooden boards by a hand crank. The noise volume is greater than with the hand swung simpler device because the wooden case vibrates just as a violin body does, thus becoming a resonating chamber. The precise term for this instrument is an "indirectly struck idiophone"; that is, it creates sound by the instrument vibrating as a whole—without the use of strings or membranes, but the sound is not produced by a player striking the flexible wooden board directly, but rather indirectly by turning a ratchet. In the modern Hornbostel–Sachs classification of musical instruments, it is number 112.24. Even this kind of elaborate encased ratchet noisemaker has been used for centuries; the instrument shown below (right) is from the 14th century and is from France. (Note that the instrument is in the form of the façade of a Gothic cathedral; ingeniously, the top of the arch is the "flexible wooden board" that comes into contact with the gear mechanism to produce the clicking sounds.) 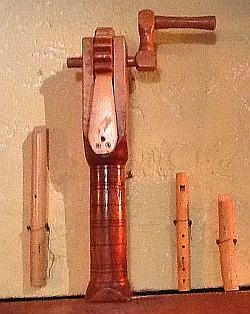 There are also simpler folk versions of the encased instrument (below, left). English can call both the mechanical device and the musical instrument a “ratchet,” though, as noted, the instrument might also be called a “noisemaker” or "cog rattle". 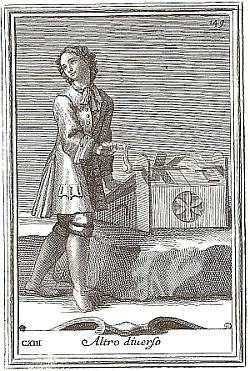 * Italian distinguishes between the mechanical device, called “cricco” and the musical ratchets: the simple hand-held noisemaker (left, top of page) is a raganella or tric trac; the other three images (top of page, right, and in this paragraph, left and right), that is, the encased ratchets, are examples of a macinillo, from the Italian verb macinare —to grind. Hmmmm, maybe this really is a pepper mill and they put it in with the flutes just to confuse me. Speaking of confusion, the idiophone —musical instrument— should not be confused with ideophone—a word that sounds like what it represents (also called onomatopeia, such as tick-tock for the sound a clock makes. Fortunately for you, the Italian raganella is also called a tric trac, clearly meant to represent the clicking sound of the instrument; thus (....wait for it...ratchet roll, please...) the instrument is an ideophonic idiophone! Thank you. *But a word about rattles: To call a ratchet any kind of a rattle is a misnomer. A rattle is a shaken idiophone, producing a sound when directly moved or struck by the player. For example, Latin-American rattles called maracas are widely known and used in popular music. They are typically made from dried gourd shell and filled with seeds or dried beans and mounted on a wooden handle. The sound comes as the contents of the gourd strike the inside wall as the instrument is shaken. Rattles, in general, go back at least to ancient Egypt where they were viewed as sacred and used at funeral rituals to signify regeneration in the afterlife. Important: rattles are shaken (not stirred)! There are many variations on the musical ratchet. They are similar in construction and even social function. The two examples below are from Antique Musical Instruments and their Players, 152 Plates from Bonann's 18th-Century "Gabinetto Armonico." Dover publications, New York. 1964. Accompanying texts by Frank Ll. Harrison and Joan Rimmer. The item on the left is a box rattle. The caption cites a source that says "they often have a magico-religious significance and are frequently part of the equipment of the witch-doctor." The item on the right is captioned as a "large rattle used in Holy Week in Spain and Mexico. It was placed in a bell tower and could be hard over a great distance." The use of noise makers in some religions is wide-spread at certain times when the sound of bells is banned. Also, in Judaism, the gragger (also grogger - similar to the small ratchet at the top left of this page) is used for the holiday of Purim. It is used to symbolically drown out the name of Haman, the persecutor of the Jews. This beautiful instrument is a Good Friday ratchet built in the 1880s; it is from the town of Rottenburg am Neckar in Germany. Ludlow museum in Shropshire, England. Miscellaneous! Ratchets may also be called “mechanical stridulators.” (Crickets, for example, 'stridulate' —rub their body parts together— to make that chirping or grating noise. (Just you try that!) Simple hand-held ratchets have been used for general carnival-like merriment, to warn against poison gas attacks (pictured,left), to scare birds away from the grapes in vineyards, and to annoy many mommies and daddies. The ratchet is also found in the instrument sets of various methods that promote natural music education in young children, such as the Orff Approach, Kodaly Method, Suziki Method, etc. In symphonic music, Tschaikovsky's Nutcracker Suite and Till Eulenspiegel's Merry Pranks by Richard Strauss have a ratchet; Schoenberg uses one in his opera Moses and Aaron and also in his massive cantata, Gurre-Lieder (where he also has six timpani and large iron chains! Only one ratchet—bah!). The Pines of Rome by Respighi uses a ratchet in an unusual manner —the ratchet clicks are employed individually and rhythmically rather than as a sustained whir of clicks (for which you need one top-notch ratcheteer! ), Carmina Burana by Carl Orff has a ratchet, and back in 1760 the interesting Toy Symphony (Kindersymphonie/ Children's Symphony) has one. No one is sure who wrote the piece; some say Haydn, some say Leopold Mozart; some say, Does it really matter?